In this article, we are going to learn an interesting Mathematical technique to find, if the given number is a perfect cube or not. It is very important step while computing cube roots. Infact, before applying any method to find the cube root, we have to check whether it is perfect cube or not and then accordingly we choose the technique. For example, following scenario tells us the importance of finding perfect cube step while computing the cube root. Example : 1728 has cube root 12 since two groups are 1 and 728. From 728, we derive last digit as 2 from 1 (first group), we derive first digit as 1. So, cube root of 1728 is 12. But now, if number is 1278, which again has two groups: 1 and 278. 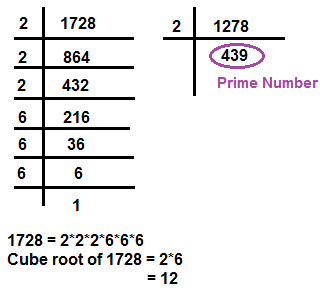 It can derive the same last digit as 2 and first digit as 1 , which implies that cube root of 1278 is 12, which is not true because technique stands true for perfect cube root only. There is a simple technique to check whether the number is perfect cube or not. For this, we add the digits of the number. 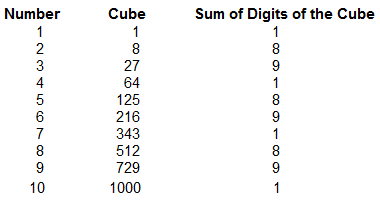 See the below chart in which we add the digits of cubes from 1 to 10. Above example shows that sum of digits of a perfect cube is either 1, 8 or 9. However, it is not true that all numbers which sum to 1,8 or 9, will be perfect cube. Sum of digits of 1728 and 1278 are same i.e. (1+7+2+8) = (18) = 9 . But 1278 is not a perfect cube. For bigger numbers, factorisation could be time consuming technique. Hence, for large numbers, we shall apply general method of finding the cube of root. (7) The seventh place by c³ ; and so on. (2) From the second dividend, no deduction is to be made. (7) from the seventh, subtract c³. ; and so on. (a) Quotient(Q) is closest minimum exact cube to the first cube i.e. 'F' term used in last two articles. (b) And, Reminder(R) is the difference between the first group and closest minimum exact cube.